A previously-reported mixed-use project slated for Los Angeles’s Koreatown neighborhood has added storied architects Pei Cobb Freed & Partners to its project team. According to a Los Angeles Department of City Planning report, the so-called Wilshire Gate project aims to bring a 200-key hotel, 250 condominium units, 21,320 square feet of restaurant and retail spaces, and 16,410 square feet of offices to the transit-adjacent site located at the intersection of Vermont Avenue and Wilshire Boulevard. The project includes 279 residential parking spaces as well as 204 parking stalls set aside for the commercial and office uses. The project will also include 250 long-term bicycle storage lockers as well as 25 short-term bicycle storage spaces for a grand total of 275 bicycle stalls. The current iteration of the tower proposes more affordable units and fewer bicycle parking stalls than previous versions of the development. The project’s residential component includes 22 affordable housing units set aside for “very-low income” residents; these units will allow developer Jia Long USA to receive a density bonus on the project, which boosts the tower’s overall possible height to 450 feet. The project will include landscape architecture services from YKD as well as executive architectural services from Archeon Group. 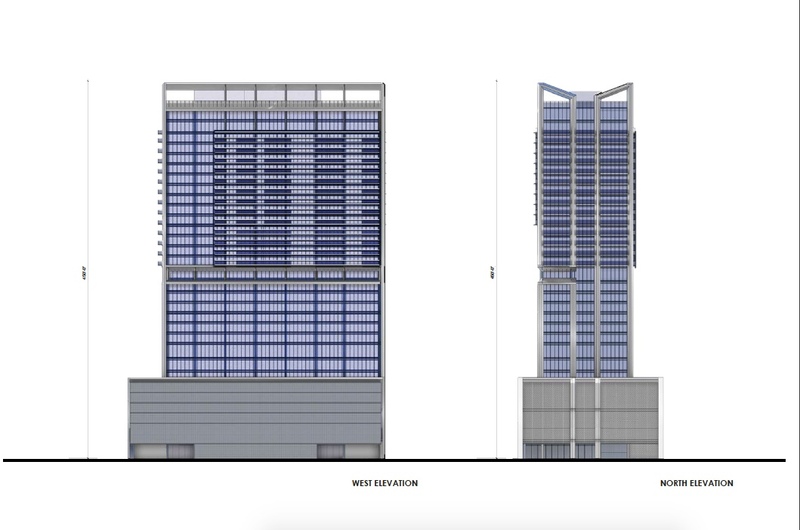 Renderings for the project depict a conventional glass curtain wall–clad tower-over-podium arrangement with a gridded organization of projecting balconies occupying a central area of the tower’s west-facing facade. Documentation for the project specifies aluminum composite panels and storefront systems for ground floor and podium-level areas, with PPG low-E glass wrapping the majority of the tower. The tower will contain seven parking levels above two retail floors, with the hotel program rising above. A hotel amenity level will be located on the eighth and ninth floors of the complex. The development’s residential units will be located along the upper half of the building, with the uppermost floors occupied by a pair of penthouse levels and a rooftop amenity terrace. The project site is currently occupied by a pair of commercial structures that will be demolished to make way for the new development. The project will also be located adjacent to the recently-proposed Korean American National Museum by Gruen Associates. The project is scheduled to begin construction later this year and is expected to be complete sometime in 2019. The project will be up for review by the Los Angeles City Planning Commission on November 9, 2017. Large Architecture, Jamison Services, and Hankey Capital have revealed new renderings for 2900 Wilshire, a mixed-use high-rise development slated to bring a 23-story tower with 644 apartments and 13,000 square feet of ground-floor commercial space the Koreatown neighborhood in Los Angeles. Renderings for the project depict a curvaceous tower clad in floor-to-ceiling curtain walls studded with narrow vertical metal panels. The tower’s facades feature alternating and deep-set balconies along the rounded corners of the tower’s V-shaped mass. The complex is topped by a grassy rooftop amenity level and its parking podium also boasts amenities, including a swimming pool. The new renderings are an update over previously-released views that accompanied an earlier planning submittal. The updated images portray a slightly more streamlined structure with more pronounced balconies and highly-polished cladding materials. 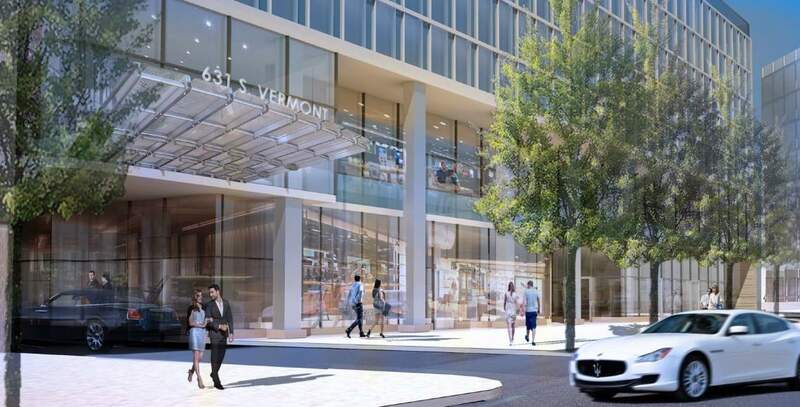 The development is slated for a site located opposite the neighborhood’s Lafayette Park and comes amid increased high-rise development in a predominantly working-class area fed by a growing public transit network. A timeline for the project has not been released. 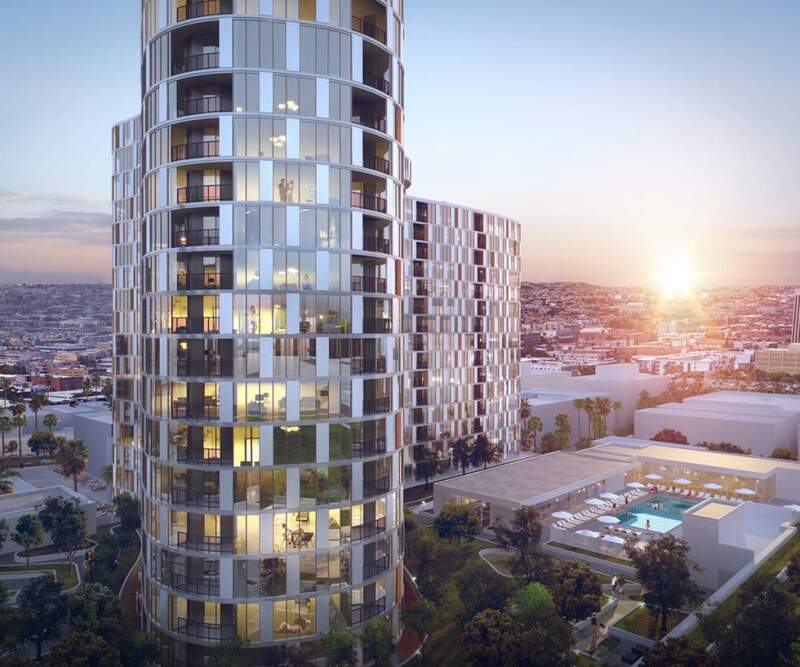 Los Angeles–based architects Archeon Group and developer Jia Long USA are working to bring a 33-story mixed-use tower to Los Angeles's subway-adjacent Koreatown neighborhood. The 420,000-square-foot podium-and-tower complex will bring a 200-key hotel, 250 condominium units, 28,490 square feet of retail, 49,227 square feet of offices, and 545 parking stalls to the area in a somewhat retro-looking dark glass-clad design. The project’s automobile parking stalls will be joined by 344 bicycle parking spaces, 286 of which will be deployed as long-term bicycle storage lockers. Of the 250 condominium units, 18 will be set aside as “very-low income units,” according to documentation filed with the Los Angeles Department of City Planning. Documents show that the designers intend to wrap the podium levels in metal louver systems, with storefront areas demarcated by large expanses of reflective glass. The project's silhouette is outlined in vertical bands of aluminum composite panels that rise up the building’s edges and cut across its midsection, demarcating the end of the hotel and office programs that occupy the lower half of the tower mass from condominiums above. The building’s upper half is studded with wide, glass-framed balconies and a series of penthouse levels that will be occupied as offices by the developer. The tower rises to 450 feet at the highest points of its building’s pointed architectural cap; the cap will frame rooftop amenity spaces. The project joins a growing list of upcoming mixed-use high-rise projects slated for the areas immediately around L.A.'s Purple Line subway. The subway line is currently being extended to the city's Westwood neighborhood in conjunction with ongoing regional transit expansions. Construction on the project is set to begin later this year and is expected to conclude in late 2019. At the lunch, Ridley-Thomas requested the contribution from Sony, according to his chief deputy. In September, the money landed in the coffers of the political action committee he founded to promote candidates and causes such as African-American voter registration. And two months after that, Ridley-Thomas voted for the museum project. All parties involved insist there was no connection between the contribution – far and away Sony's largest in California that year – and the supervisor's vote. Such a link could be a violation of campaign finance law. Peter Zumthor's $ 600 million plan for the Los Angeles County Museum of Art (LACMA) is changing. Again. According to a piece in the Los Angeles Times, the sprawling and curving black form has been angled off, weighted to the south, and outfitted with greyish, double-height galleries poking up above the main mass' roofline. The building still swoops over Wilshire Boulevard to avoid disturbing the La Brea Tar Pits, but it will now have just two entrances (instead of seven), at its north and south ends, and its continuous loop of perimeter hallway galleries has been removed. "Peter hasn't given up the curve. But he's really, really reined it in," LACMA Director Michael Govan told the Times. The latest design will be discussed tonight, Wednesday, March 25 at Occidental College, as part of the school's "3rd Los Angeles Project," a series of public events examining the city's move into a "dramatically new phase in its civic development." Members of the panel will include host Christopher Hawthorne, Govan, journalists Greg Goldin and Carolina Miranda, and architects Sharon Johnston and Mark Lee. 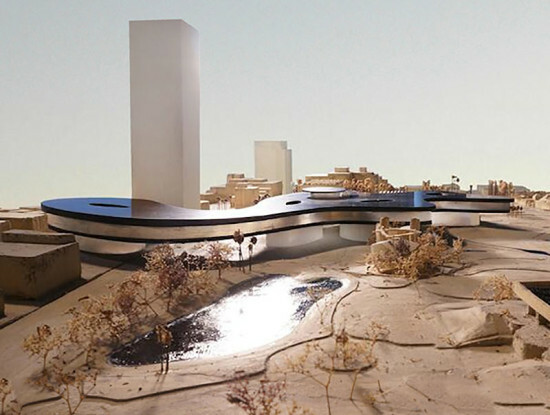 The Los Angeles Board of Supervisors has approved initial funding of $125 million in bonds (pending approval of the project's EIR), but LACMA still needs to raise about $500 million to make Zumthor's in-progress scheme reality. And Now A Gehry Tower For LACMA? What’s Next? The surprises keep coming at the Los Angeles County Museum of Art (LACMA). 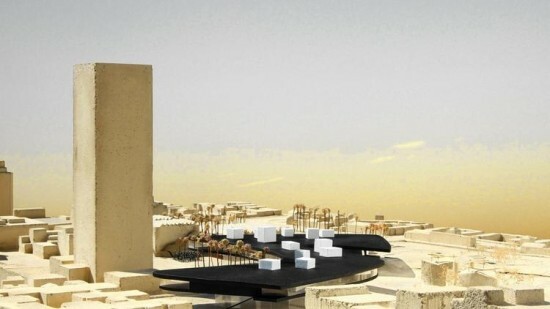 After learning that the museum plans to shift its proposed Peter Zumthor–designed building southward (partially bridging Wilshire Boulevard) to avoid damaging the La Brea Tar Pits, now comes news that the museum is hoping to partner with LA's transit agency, METRO, to build a tower across the street. LACMA Director Michael Govan's choice for an architect? Frank Gehry. "That's my dream," Govan told the LA Times' Christopher Hawthorne. "I'm jealous that New York has a Gehry tower and we don't." The tower would be located near Wilshire and Fairfax, near the site of the current A+D Architecture + Design Museum, which is being torn down to make way for a staging ground for Metro's Purple Line expansion. Ironically Govan said he hopes to build his own Architecture and Design wing there. No word on the tower's design or height, or on whether it will even happen. But Gehry has acknowledged discussing the plan with Govan. "I'm open to it," he told Hawthorne. So far Govan and Gehry have been unavailable for comment to AN. There are so many obstacles standing in the way of these grand schemes. 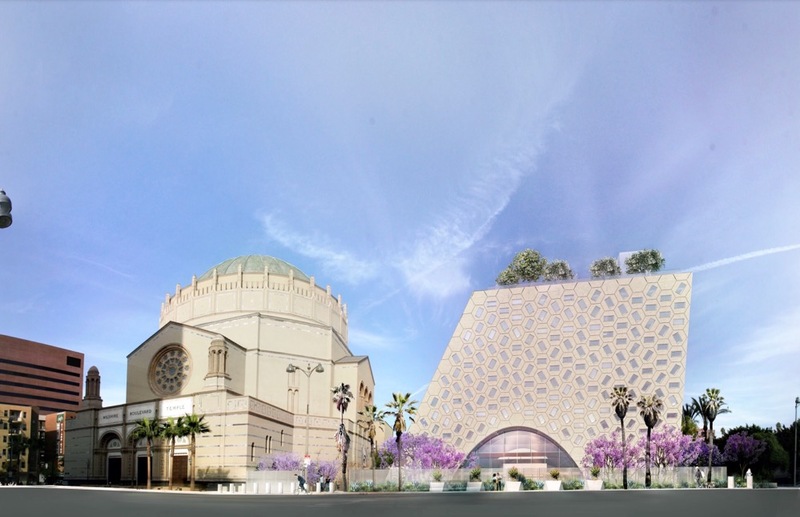 But a post on LACMA's blog points out that if they go ahead, one block of LA's Miracle Mile will contain designs by three Pritzker Prize winners— Gehry, Zumthor, and Renzo Piano, who not only designed two new buildings for LACMA, but is designing (now solo) the Academy of Motion Picture Arts and Sciences museum. Culver City firm wHY Architecture has been selected to design a new art museum in Los Angeles for Maurice and Paul Marciano, the founders of clothing empire Guess? Inc. 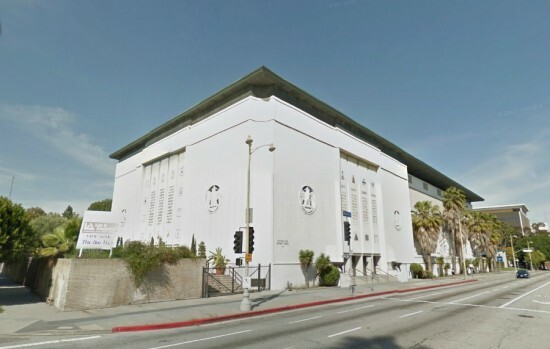 The museum will be located inside a marble-clad, four story Scottish Rite Masonic Temple on Wilshire Boulevard near Lucerne Boulevard. When retrofitted in 2015, the austere building, originally designed by legendary artist Millard Sheets, will contain 90,000 square feet of exhibition space, showing off the Marciano's impressive collection, which will be open for "periodic exhibitions for the public." wHY has also designed L&M Arts and Perry Rubenstein Gallery in LA, an expansion of the Speed Art Museum in Louisville, and the Tyler Museum of Art in Texas. They're also working on a Studio Art Hall at Pomona College outside of LA. Every once in a while forces converge and we get an epic architecture weekend. One of those weekends is happening now. Here are some of the events going on in LA this weekend: 1.) Hollywood Wilshire Boulevard Focus Weekend, featuring free admission at the A+D Museum, Hammer Museum, Craft and Folk Art Museum, MAK Center, Fowler Museum along Wilshire Boulevard as well as events at all the institutions. All revolve around the Getty's epic Pacific Standard Time series of exhibitions. 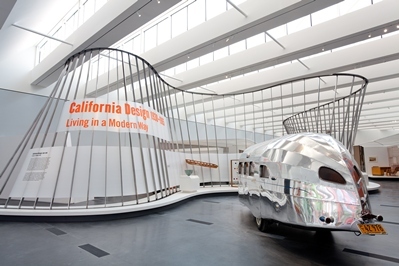 These include: A discussion called The Legacy of the California Design Exhibitions at LACMA; a talk with Deborah Sussman about Eames Designs at A+D; a panel about Mapping Another L.A.: The Chicano Art Movement at the Fowler, a discussion about Now Dig This! Art and Black Los Angeles 1960 – 1980 at the Hammer; and a about Sympathetic Seeing: Esther McCoy and the Heart of American Modernist Architecture and Design at the MAK Center. 2.) Launch of the exhibition, Architecture—A Woman's Profession at WUHO Hollywood and a Saturday panel discussion at the MAK Center, moderated by AN's Sam Lubell and featuring author Tanja Kullack as well as Barbara Bestor, Monica Ponce de Leon, Dagmar Richter, and Ingalill Whlroos-Ritter. 3.) Inglewood Open Studios, featuring visits to the studios of more than 30 artists (and a few architects) in this emerging arts district, but showing off great arts spaces like the 32,400 square foot Beacon Arts Building.